Natalie Kerns was born in Wadestown, West Virginia. Upon graduation from Clay Battelle High School she went on in her academic career to pursue a degree in veterinary technology. She completed the veterinary technician program at Fairmont State University in 2005. After graduation she worked in several fields of veterinary medicine including; large animal, equine, small animal/exotics and emergency medicine. 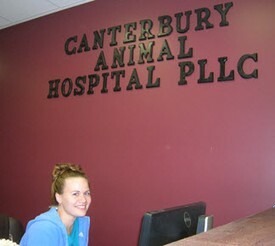 She joined Canterbury Animal Hospital in 2012 where she works as a registered veterinary technician. Natalie has special interests in surgery and intensive care nursing. Natalie enjoys spending time working on her farm, gardening and is an avid equestrian. Karie Hardy RVT graduated with a degree in Veterinary Technology from Fairmont State University. Karie started her career as a veterinary technician at Canon Hill Veterinary Clinic in Canonsburg, PA, where she spent 4 years working with an equine veterinarian. In 1995, she moved to West Virginia and started working at West Virginia University as the RVT taking care of the livestock at the Animal Science Farm. She spent 10 years at WVU before moving on to expend her career in small animal emergency medicine. In February 2016, Karie joined Canterbury Animal Hospital where she enjoys focusing on client communication and preventative care. Karie, her husband, and their three daughters live on a small farm in Fairmont. When Karie is not at work enjoys taking care of her three horses, three cats, two bunnies, one dog and a small flock of chickens. She also enjoys horseback riding, gardening and spending time with her family.